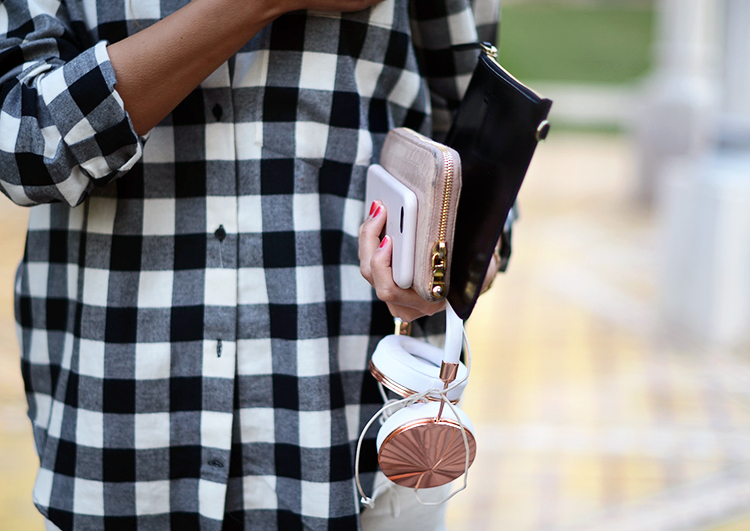 Oversized flannel shirt with white denim shorts, and rose gold details. This was my daytime outfit, but already with my nighttime makeup. Spent the day by the pool, refreshed myself and now I’ll change the shorts into jeans and grab a bigger bag. Again I’m posting in a hurry right before dinner. It’s funny how fast the time goes by even without doing much stuff, I feel like there isn’t enough hours in a day! Thank god we chose to spend here 10 days instead of the usual one week, one week would have been over today. So until Saturday I still have time to enjoy the sun, read books, eat hotel breakfast buffets, write and meditate (hahah yes!) and just be. Oh and of course take pictures, that’ll be my main job for tomorrow, the time has gone by so quickly I hadn’t done that nearly enough. One thing though I’m waiting back at home, a fast working internet. Still struggling with that here. But every time I pass the hotel lobby I refresh my e-mails and read the comments, that last one with a huge smile on my face, later tonight I’ll take the time to answer them! Again gotta run, a nice Wednesday night all! Mustavalkoinen oversized flanellipaita, vaaleat farkkushortsit, ja rosekultaisia yksityiskohtia. Siinä tämän päivän asua, mutta jo illan meikillä. Vielä kun vaihdan shortsit farkkuihin oon valmis illalliselle. Jep taas kiireessä postaan ennen illalliselle lähtöä. Hassua miten nopeasti täällä kuluu aika, vaikkei erityisen paljon tekisikään, mutta tuntuu ettei tunnit päivässä riitä! Auringonottoa ja ulkona olemista, lukemista, syömistä, nukkumista, vähän kirjoittamista ja meditointia (haha kyllä), ja siinä se päivä jo hurahtaa. Huomisen tehtäväksi otan kuvaamisen, en ole ottanut vielä läheskään tarpeeksi täällä kuvia! Onneksi loma on tällä kertaa 10 päivää sen perinteisen viikon sijasta, viikko olisi tullut täyteen tänään. No yksi kiva juttu kotona kuitenkin odottaa, toimiva netti nimittäin. Aina hotellin aulan läpi kulkiessa pysähdyn tönöttämään kännykkäni kanssa kaikkea päivitellen meileistä kommentteihin, kommentit on olleet niin ihana päivän piristys! Tänään myöhemmin istahdan vastaamaan niihin kunnolla. Nyt pitää taas mennä, mukavaa keskiviikkoiltaa! Like your perfect casual outfit!!! & I fell in love with that wallet! The shirt looks super cozy and comfy! Lovely, laidback outfit! Love the shirt! Enjoy the rest of your holidays with your family!! Cute outfit! I like your watch! Have you already got the parcel from Anna and me? I bought it from a big store selling electronic stuff, but I think the leather case is made by Apple! They had it in many colors 🙂 Thank you! Lovely pics! I wish I were in a sunny, warm place right now. Thank you Miri! 🙂 I’ll probably be wishing that soon too when I get back home… Luckily spring and summer is ahead of us! We miss your frequent posts, but enjoy this relaxing time with your family! What a perfect way to start the new year! Your hair and makeup look very beautiful! 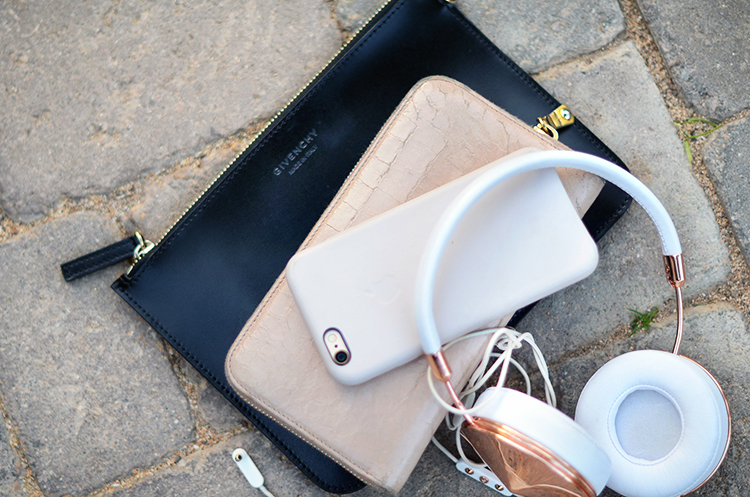 I love the black pouch and the pink wallet! I need more light pink in my life hahaa 😀 I could also use some sunshine because it has been so rainy and cloudy where I live. Can’t wait to see some beautiful sunshine-y photos! Great outfit, I love the over-sized flannel shirt! I love this look! It’s so fresh and summery. Oh btw you got our parcel? 🙂 perfect! Especially your Givenchy clutch! Great piece! 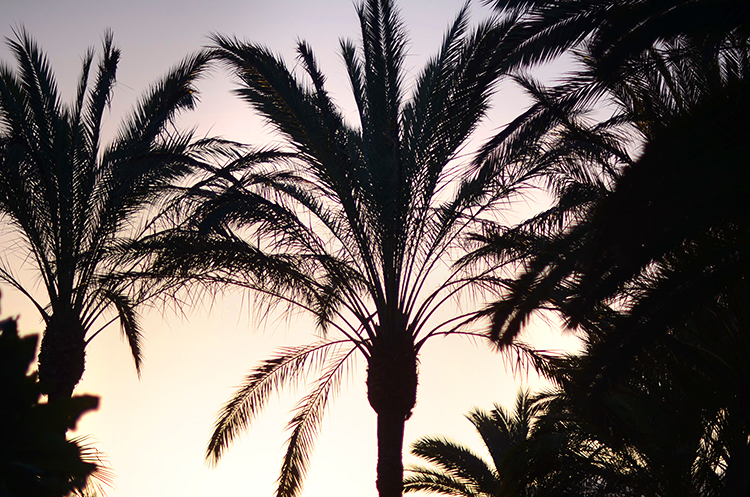 Oh, this sunset, theses palm trees… make me longing for Lanzarote! you look perfect, as always can’t wait to be back in Gran Canaria as soon as possible. What a gorgeous summery look. Your makeup looks stunning!!! I always love your posts Mariannan! 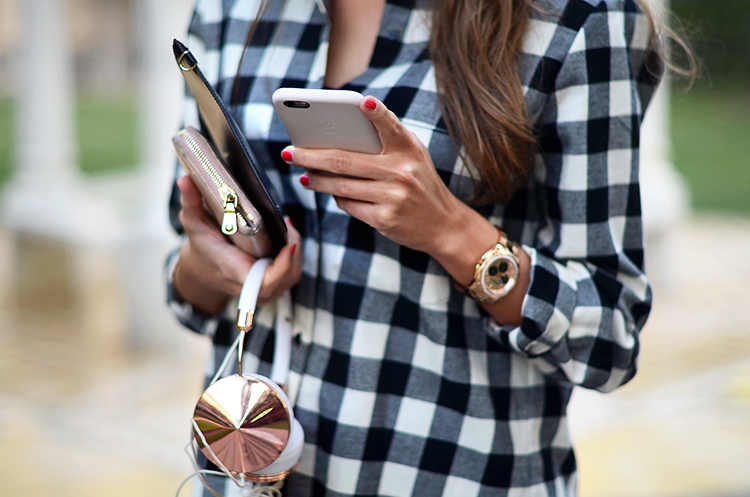 You’re one of the bloggers I check on a daily basis! I’ve recently started a blog and hope it is as read-able and relate-able as yours! You look awesome 🙂 enjoy your time! Looks stunning on you, as usual! I think you can wear anything! That phone case is amazing! Could you tell me where you got it? Love the shirt you’re wearing. What a lovely outfit this is. I just discovered your blog. I’m glad I did! Looking so nice and warm there! Im lucky to get sun very soon also! Have a great time and great outfit also! This shirt is from new zara collection ? Whilst by yourself’re there, keep track of out the large bust of Ben Franklin at 4th and Arch. It is coated with keys donated by way of area schoolchildren. Below’s the uwishunu tale upon its perseverance.